When you're working hard and have solid faith America is still the land of opportunities. A person who looks at things with a 'half full' attitude can keep himself happy than a person who views things with a 'half empty' attitude. That is the case of my friend Nick Poulmentis who problems, crisis, and unfortunate situations don't stop him from following his goal and dreams. Nicholas had no slight idea that he would be declared the winner of the famous "Chopped" competition. He, however, trusted his guts and put his longtime professional practice into use. To his surprise, he was declared the winner of the contest. It came to him as one of the most significant surprises he has ever received in his life. Chopped is one of the greatest American reality shows formulated by the famous Food Network with the interest of building and growing cooking talents. With the help of sponsors, Chopped can reward chefs who portray their capacity to cook, through creativity or otherwise. In essence, each round presents ingredients (provided by the show organizers) whereby the chef is required to use all of them. A panel of 3 judges is mandated to evict on the chef in each course on the grounds of not measuring up with the stipulated taste, and for not being creative enough. The chef who passes all the stages and meets the preference and expectations of the judges gets $10,000. 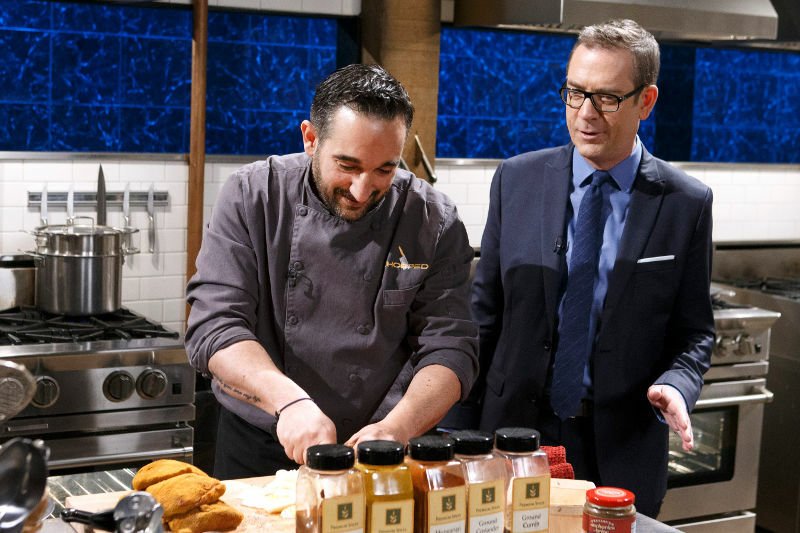 "Chopped" provides an opportunity to four chefs who are expected to face off against one another in preparing an outstanding and spectacular 3-course meal. That implies that the chefs are expected to make an appetizer, entrée, and a desert. Nick has been in the cooking profession for a remarkably long time. During his victory at "Chopped," he worked as a head of a restaurant based in Europe and New York. That prepared him for such competition since he had already garnered enough knowledge. It was a major surprise for the judging panel that examined Nicholas. The judges did not expect such a level of creativity and professionalism, coming from Nicholas. Even Martha Stewart, with all his criticism, was impressed by the performance of Nicholas. But Nick is not just another chef. He is the only chef in Manhattan honored with a Michelin Star, and he is a special guest chef at the White House. Nicholas was required to prepare a delicacy that he had never done before. Even at first was a bit nervous, since the recipe that presented to him was very new, he manages to impress the judges. In fact, also confessed that had not tasted such a delicacy before. In other words, he was required to be as creative as he can be, and that is what he did. With his nervousness, he embarked on the quest to prepare a meal that has different ingredients including Sirloin, nori, and porgy. However, one of the elements was a surprise to him. He had not used or tasted corn dogs before, yet he was required to prepare a delicacy that had the said ingredient. In his experience, Nicholas exposed to a wide range of ingredients. After all, he was the head of many restaurants in Europe as well as in Manhattan before this. Nick Poulmentis was born in Manhattan to Greek immigrants. His parents later migrated to Greece when Nicholas was still of tender age. His passion to cook began when he was still young. Nick made a significant step when he decided to enroll for training in one of the institutions in Greece and another one in Paris, France. It is here that he was able to cement his knowledge and expertise in cooking. Le Cordon Bleu based in Paris, and it is one of the institutions that shaped the chef's career. He began his journey to becoming a great chef when he managed and helped in running his family's hotel. It was here that he was able to understand the Greek recipes and other cuisines in the world. To his surprise, he garnered more knowledge than he thought when he was working in his family hotel. Nicholas as a very inquiring mind went to the extent of even growing his tea and processing his olive oil. Poulmentis was not able to continue with his career in his family hotel since there was the issue of the Greek financial crisis. However, and for his good fortune, he decided to pursue his dreams where he was born. The United States of America. The land that still offers plenty of opportunities to hard working talented people from all over the globe. After all, he was expected to support his family financially. He moves to New York to further his career. It was never easy for him to restart his career especially when he moved to NYC and lost his father. That was an added challenge for Nicholas. However, time healed him, and he was able to move on with his life as a chef. He was even privileged to cook for the former President of the United States of America Barack Obama. He was invited as a guest chef in the White House, and this was when he had the chance to cook for the former president. Ever since he established himself in New York, Nicholas's fortunes have been on the rise. He has managed to serve great personalities in the world, including the former US President. In a nutshell, Nick deserves his victory. He has worked hard enough to achieve this. No one can dispute the fact that Poulmentis has enough experience and above all is a very humble family man, focus and devoted entirely to his career and family. He is genuinely creative and talented indeed, and this is one of the advantages that he enjoyed during the contest. $10,000 is a grand prize for a great chef. In fact, he is bound to grow his name even further, now that he has and the knowledge and the reputation. All the best Nicholas!